President hopeful Tan Jee Say has garnered the support of National Solidarity Party's Nicole Seah. "I just want to say that I want to endorse Tan Jee Say for President because I think he really has what it takes," said Seah in a video clip posted on Tan's website and Facebook page over the weekend. "We need a President who is intellectual, who is a brilliant thinker, and not only that, someone who has a heart for the people and who can represent Singapore on the greater world stage," she said. "So please vote for Tan Jee Say." Seah, who is an NSP central executive committee council member, said she was making the endorsement in her personal capacity. 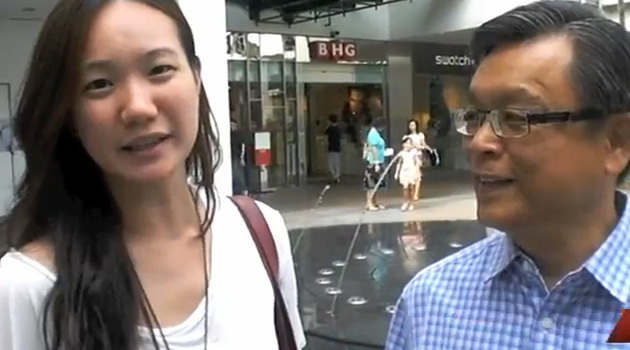 She was with Tan, 57, at Bugis Junction to shop for new clothes, she said. The video clip had received 120 likes on Tan's Facebook page as of Monday noon. Tan, an investment advisor and former civil service high-flyer, collected the Certificate of Eligibility forms two weeks ago in a bid to contest the upcoming Presidential polls. Tan said he wants to be "an active president, engaging the nation on issues of conscience and promoting worthy causes alongside Singaporeans". To run for the Presidency, Tan has resigned from the Singapore Democratic Party. Other than Tan, other Presidential hopefuls Dr Tan Cheng Bock, Dr Tony Tan and Tan Kin Lian have also been quick to turn to new media in the run-up to the Presidential Election.